Petite in size, big on flavor and fulfillment. The Ashton Esquire line of hand-rolled premium cigars offers two very distinctive styles to choose from. Produced at the Château de la Fuente in the Dominican Republic, both of these cigarillos are hand rolled individually with complex blends of Dominican long fillers and binders. The Ashton Esquire Naturals are wrapped with carefully selected rich tasting Connecticut shades while the Ashton Esquire Maduro’s are bundled up perfectly in a silky smooth Connecticut Broadleaf. 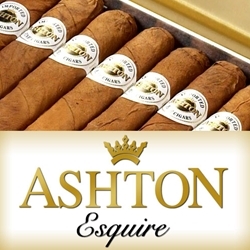 Offered in a package of 10 Tins of 10 cigarillos each, both styles of the Ashton Esquire premium hand rolled cigars provide a sweet and smooth smoking experience for any smoker who enjoys the relaxation of a high-quality cigar or just needs a quick smoke on the run. Smokers Discounts has made it easy and affordable to buy premium hand rolled cigars online. Every product can be delivered right to your doorstep. A variety of sizes and flavors are listed below in our online cigar store. Each of these styles are in stock and available for a low discount price! Call us for more details!